It’s been a long time since I’ve managed to get out on the bank or beach. So long that when we recently moved house my rod tubes and holdall’s had developed elaborate spider’s web decorations. My seat box had been yet again ravaged by mice (they seem to like the foam), and I found what looked like a hibernating hornet nestled in between my landing net and keepnet bags. This didn’t make the journey to the new house… I hate Wasps and Hornets. Bees can crack on, Wasps and their even angrier cousins. No thanks. It’s been a crazy busy few months; house moving eats time… and money. But now slowly the dust is beginning to settle and I found I had the chance to get out for an early morning session on Portland. My wife, the little’un and I had been down there on Easter weekend, and the ledges screamed fish. So I had to get down there and give them a bash. Low tide was 10.14am so I arrived in the car park at 7.45 with a few hours of float fishing and spinning/ledgering ahead of me. After joining a brilliant sea fishing forum and doing a bit of reading, I headed straight for Pulpit rock. This is a peg (if you can call it that) all on its own, a frigging large man made column of rock jutting out slightly into the channel. 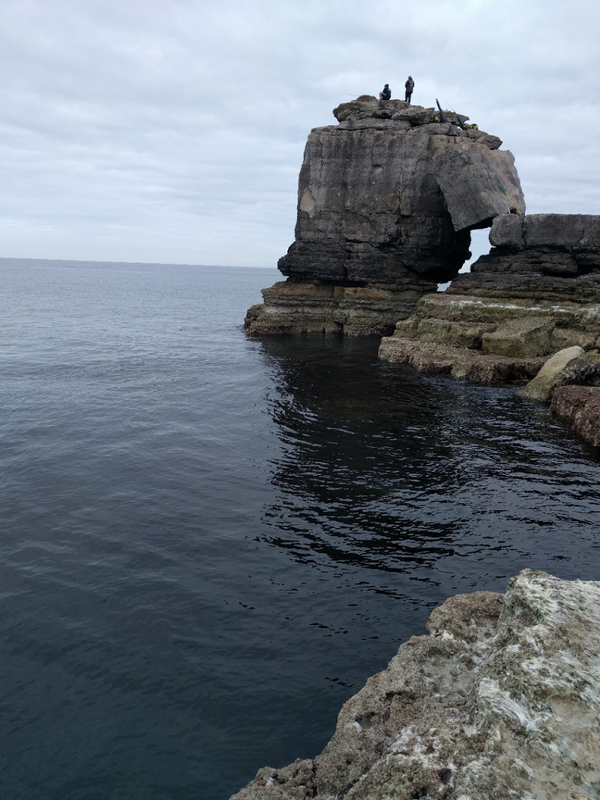 The height and position of it means you’re casting further into deep water, only problem is you basically need to be very stable and a capable climber or have ropes and a harness to scale the chunk of rock that it is propped on it. It is relatively sturdy (as in it must weight multiple tonnes), and is supposed to depict an open Bible. Still, I would not be climbing it, not for me I’m afraid! I opted to fish the ledges to the left of Pulpit, they were slowly exposing themselves, and although it looked very fishable they were all covered in thin white hair like weed. I can completely vouch that this sh!t is slippery and the steps/ledges down are not that easy to scale. Still, I was here and the fish weren’t going to catch themselves. I made it to the water after only nearly slipping in the drink once! The guys on Pulpit told me they hadn’t had any, as yet, but I had no idea how long they’d been fishing. 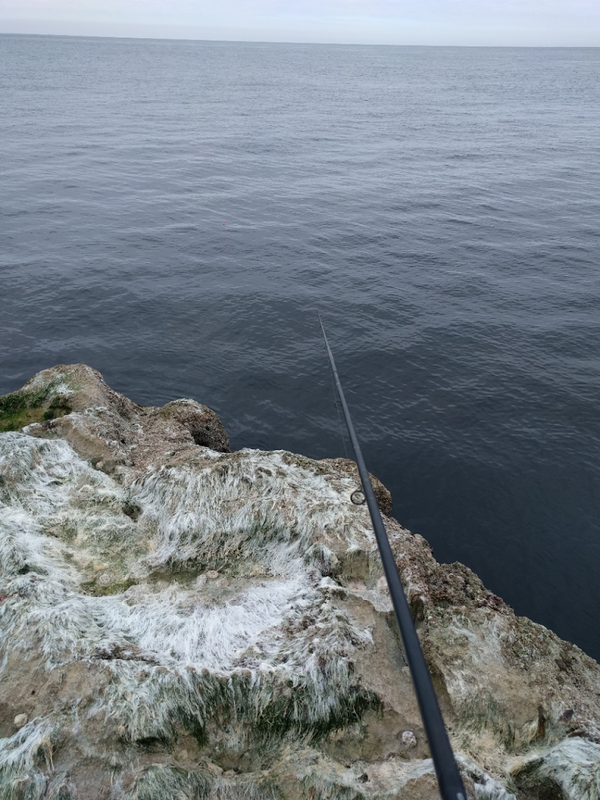 I set a float rod up fishing at about 5ft deep fishing around 20 meters out and a light spinning rod on a small ledger which I would be casting/swinging out (less than 5 meters). I’d be using stretched 20lb clear amnesia for rig back bone and snoods connected by FG knot on to 40lb braid. Don’t judge me, I’m quite new to this type of sea fishing. I slung the float out and watched it bob around in the current, then became aware that the guys fishing Pulpit rock were casting in a 160 degree range. Casting any further would be out then… In the mean time I set up the spinning rod and plopped out a small rag worm. Within a second “pluck”, a bite! Here we go it thought – But could not connect. These little blighters were mightily fast, and I just couldn’t connect, but it was promising seeing the constant bites. It was almost like coarse fishing, with a much lower catch rate. I needed smaller hooks and lighter line! I was intermittently slinging the float back out from time to time, but it wasn’t seeing much action, I increased the depth and used some squid and plopped that back out, just shy of Pulpit angler’s line. They had been catching some fish, one of which was a bass and had got “f’ing caught in the f’ing kelp! Can’t f’ing budge it!” as well as a few wrasse of varying sizes. I was surprised that these guys didn’t have a drop net; unfortunately you could hear the resulting “SMACK” of the wrasse being returned to the water. Indeed you could see the poor bugger float passed as the tide started to change direction. This was a bit of a low point for me and my morning’s fishing. Watching fish that I would have been pleased and proud to catch, floating passed belly up. One was so big a seagull couldn’t even lift it out of the water. I did say few times “Really, you’re just going to drop it?”. But my comments fell on deaf ears. 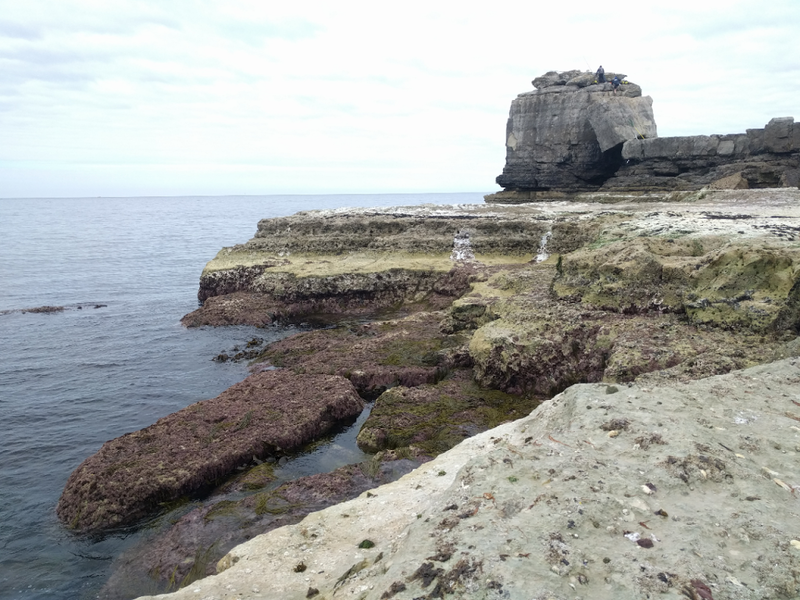 Interestingly, I didn’t hear the splash of any bass going back, I can only assume they clambered down, and made sure the protected species was carefully returned to the surf, and not the fishing rucksack on the rock that had begun to bulge. About 45 minutes before low water I switched from a ledger to a 12g Fiiish Black minnow. I know it’s not the time of year to catch on this method, but I wanted to give it a whirl. They really look great in the water; hopefully I’ll catch a few on them over the coming season – Anyway, no joy on the minnow. Around low water I switched back to the float and adjusted the depth to around 7ft. 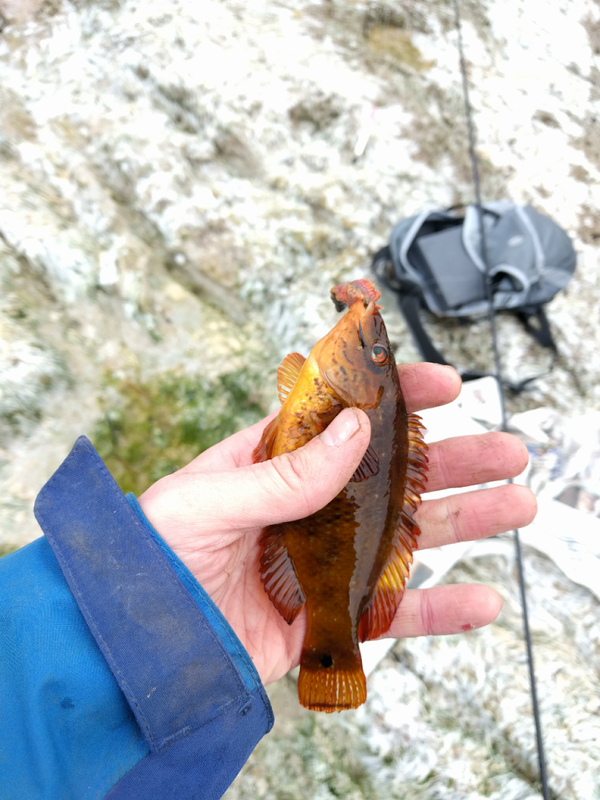 I had a bite in minutes and was saved from the dreaded blank by a lovely little wrasse! Pretty and greedy little thing! I stuck around for another 30 minutes, but decided to call it day shortly after as I had family plans. I’m looking forward to bringing back some my proper beach gear when I next visit Wales, and will hopefully get out for a few evening sessions along Chesil! So what did I learn on my foray into float and lure fishing on Portland? Commit to 1 method. Don’t try and juggle 2. When I was watching my float I was thinking “was that a bait fish rise?”, when I was spinning with the minnow, I was thinking “was that a bite on the float?”, stick to one method. It’s easier that way. Wear appropriate footwear. I had walking shoes on. I need studs or felt or something, the ledges are slippery. If you’re going to go for the smaller stuff, (essentially HRFing) go a lot lighter than a size 2 and 20lb line! Watch the weather. The time I was down there was absolutely perfect for fishing, so it was a shame I didn’t do better. But certain wind directions and bigger tides will easily make that area unfishable. Do your research. I think I’m going to either have to speak to some regulars, or go for some coastal path walks down there, especially on big tides to better plan fishing routes. As I am not part mountain goat, some of the ledges down were less like ledges and more like small cliffs! Fish the gullies. I was speaking to an angler who told me he has caught several large wrasse, Eels, Pollock and Bass by dropping whole squid, dead crab and other big baits down the gullies on both the flood and the ebb. He did say it’s boring fishing, as you only get a few bites, but when you do, they are whoppers… allegedly. Apologies if I sounded a bit preachy above, it was just quite sad to see guys catching fish, and literally dropping them back, from what I guess is about 20 foot up. Anyway, I only spent 2 and a bit hours on the ledges so I can’t give it a rating, and I’m pretty confident that this place is a freaking mecca for all types of anglers, so it’s going to need several more sessions (That’s what I’ll tell my wife!). What I will say is it is absolutely not disabled friendly fishing, and although you can park close, parking is pretty much all you will be doing, as getting down to the water on anything other a high tide requires a bit clambering. I’ll give it a whirl over the coming weeks/ months and update you when I have a better answer, or any answer… There is A LOT of Portland and Chesil to fish, but I’ll give it a good go. Previous story Trip #98 – Catch it, Kill it, Eat it!